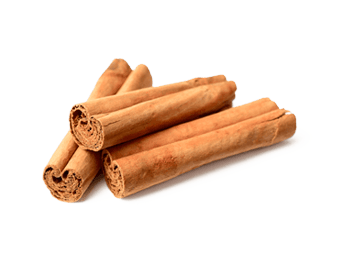 Ceylon Cinnamon (Cinnamomum zeylanicum) has a mild sweet taste, a light to medium reddish brown color and a delicate, sweet aroma. Most cinnamon found for sale is made of less expensive inferior varieties of cinnamon called Cassia, Korintje and Saigon which have a spicy bitter or pungent taste, a dark brown color and a pungent aroma. Cinnamon contains high levels of polyphenol antioxidants as well as manganese, fiber, iron and calcium. One teaspoon of cinnamon powder has up to 16% of the U.S. recommended daily allowance for manganese, 5% for fiber, 3% for iron, and 3% for calcium.